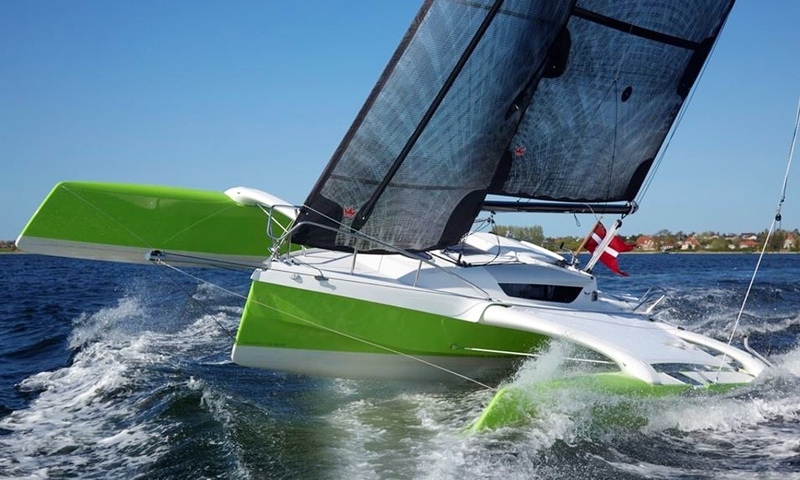 Hobie Forums • View topic - Bigger Trimarans? Ok so I love my TI and have no plans on ever selling it except to upgrade. But have been looking for something with a little more speed. I had a date with a sunfish this weekend trying to relive my teens and my back doesn’t remember it being so uncomfortable [emoji21]. It was more of a TI appreciation day than anything else. So on a whim I typed in Trimaran sailboat into google and quickly found a few leading brands. I fell in love with the Dragonfly and I think one of them will be my final sailboat in 10-20 years. Go full custom and pick everything I want and have it built. I guess about 200kish. So now I am looking at used older trimarans to be my in between boat to learn on and that are trailerable, hello Corsair! I am looking at the 24-28 ft models all years all conditions (understanding it might be a project). Does anyone have experience with them? I know this is a Hobie forum but I respect a lot of folks on this forum and figured someone might have some experience to share or know where to find some? Post subject: Re: Bigger Trimarans? Every october here in Sarasota fl, they have the buzelli multi-hull event ( not spelled right), put on by the sarasota sailing sqradron. Typically hundreds of boats, there are typically a couple dozen Windriders, many WETA’s, and many other multi-hulls. In particular there are a whole bunch of Silloettes always at the event, (I think it is their big event for the year). Some have for sale signs on them, people seem to come from everywhere for the event. I was thinking when I grow up, (lol), I might look into the Silloettes. Don’t know much about them, but there appear to be quite a few around here, (seems to be a popular boat around here anyway). There are tons of big sailing cruisers around here, monohulls 40-60 ft. Not sure I would ever be interested in those, (way too expensive and beyond my interest, (live aboard lifestyle is not for me). We have been to St Thomas, Barbados, and many Islands quite a few times, big cats appear to be the most popular boats in the islands. We also see a lot of big cats in Key West. Probably because the keys and Bahamas are all really shallow. Also the Water around the Virgin Islands gets pretty rough, watching both big cruisers and big cats, the cats look to handle things a little better. I wouldn’t dare taking my TI to the VI, (too small, and way too dangerous). I’ve been on several big cats, (50-60 footers), they are very fast. The whole region is vast, that’s the main reason for souping up our TI so we could have 100 mile/day range in the normal light winds in the keys and the intercoastal. Without needing to spend $200k, and store everything in my garage. Slips and storage are very expensive around here. Are the silhouettes cats or tri’s? I looked and didn’t see them? 2) rig and sail mostly solo, I don’t really sail solo but my wife normally has kid duty so she can help a little bit, but I like to be able to do it all myself until the kids are older to help more. Where we live now there is the whole Chesapeake bay to explore and I think a little 24-28 foot tri would be perfect to play and explore on the weekends. Sounds like I am at a similar stage to you, Defy. As a family we have only been sailing a couple of years, but owning the TI has opened up whole new horizons for us. I currently have no intention of selling my TI, but we are also thinking about the future, and a bigger boat on which we could spend a night or two. UK south coast & The Lake District, where we do most of our sailing now, but could also tow to the Med. We appreciate the pros & cons of tris v. bis v. monos, but are hooked on the concept of speed, stability, shallow draught for beaching, & deck area of tris. A 25' to 32' tri, trailer-able, fold-able, weekender would really erm, float-my-boat. So I too have a Dragonfly (28) as my most-wanted, but likely always going to be too expensive! Then there are any Ian Farrier type like the Corsair. You should check out F-Boats if you haven't already. Also love the look of the Corsair Pulse 600, but there seems little point as it's only halfway between the above & our TI - don't want to end up with 3 boats! I'd also be interested to hear other people's thoughts/experience. I owned an F24 mK 2 for 12 years. Raced it mostly singlehanded, Corsair mast raising systems are pretty easy, boat folded and unfolded easily. Was easily manageable while sailing. Not as comfortable as a Dragonfly, but faster. Lots of used ones available in the 30K range. F24 mK 1 is also a good boat for what you are doing. You will spend a lot more money in maintenance...a good rule of thumb is 10% of the cost of the boat annually. Don't forget trailer maintenance (brakes, wheels, tires, rust...). If you just want a faster TI, a windrider 17 is a good boat, but you'll need to camp out instead of snug in a cabin. Those can be had for 15K new and a few used ones pop up occasionally. If your ultimate aim is a dragonfly, find a used Corsair. As a kid, we had a family friend with an F31 (they used it to sail from Florida down to Belize and that area), but kept it here in Oregon. I remember getting to ride on it and it was a total blast. Not that it helps much, but totally cool boats! Like others said on here the Weta or windrider could be a good intermediate if you are not looking for a multi day boat. RedKite - Yes, I agree at tri sounds like the perfect mate for what we want right now. The only complaints we have about our TI is deck space and the wet ride in any sort of chop. I love how easy it is to sail, setup, clean, repair, really everything about it except the size/wet ride. Even the speed is fast enough to keep me entertained. On the Corsair Pulse 600…..drool…. I would buy one right now if I could find one for 10-15k but at 30k used I would rather get a used Corsair/F-boat. I have been finding them used for 20-30k all day long (some with a huge road trip but very doable). TPDavis- the Windrider 17 is on my list of “if I find a good used one local I’ll grab it.” But I think at that point I would lean back towards the Weta. Now the Astus 20.2 Trimaran would be neat if I found one at a reasonable used price. I see in your sig you have a Searail 19 what are your thoughts on that one? SeaRail 19 is a good boat, seaworthy and fast and a bit drier than the Corsair Pulse 600--and if you are wanting to not get wet in chop, DO NOT GET a WETA. VERY wet ride--even without chop. SeaRail 19 is faster than my old F242 by a little bit. Much lighter. Takes longer to get from trailer to sailing and back on trailer. You won't find any used ones except even more rarely than a Windrider 17 (sells about 5 a year, I think last boat sold was #20). My knock on the Windrider 17 is it points very poorly--probably worse than your TI, so if you have to go upwind, it is painful...but if you are reaching around...fun boat. SeaRail doesn't really have a useable cabin except for one person who is a good contortionist. I don't think Pulse has a cabin at all. If you can find a good F24 (or 740, 760...) in your price range, it seems like it would be a good boat for what you want while you wait for sheckels to buy the dragonfly of your dreams. If you do find a Corsair you want to try, don't skimp on the prepurchase inspection. Sail it, look for water in bilge after sailing-expect some in the amas, but not in the cabin or under cockpit. Ensure the folding mechanism is intact. Check the aka/vaka attachments for crazing and look at the aka seams for delamination. Check the mast is straight. Pretty much anything else is easily fixable. Thanks for the info on the weta. I have found a few used pulse 600 for sale but haven’t seen a searail for sale yet. People must like them. I just can’t justify 30k for one. I need a super boat show special!!! I am going to keep my eyes out for a Corsair I think it will be the closest to what I need for the cheapest price. I too am at the stage where I’ve been looking for a bit more of a sailboat than the TI. I had hoped by now that Hobie would have developed a larger trimaran! I don’t want to sacrifice any of my favourite things about the TI, so I want something light that is easily trailered and launched, quick setup, simple mast stepping, shallow draft that can be beached ...but has a planing hull and double digit knot performance. I’d like to be able to sleep on it but don’t want any extras like cupboards, sink, benches etc that add weight. I’d also like to be able to stand and move around the deck comfortably but only use the cabin for sleeping or shelter when needed. I’ve been researching for months and after looking closely at all the Tri’s mentioned above, none was exactly what I wanted. The Pulse was closest but it has no real cabin. How can you like a Seascape 18 and not prefer a Hobie Getaway? LOTS more room...sure no cabin but there's not much cabin on the seascape. Besides, with a monohull as soon as you lean, you quickly become mean. Last month I sailed my TI in the Texas 200 and there was a trimaran that I felt was quite impressive. It was a cross 18 trimaran named Crosswins and it was quite fast and looked pretty comfortable. That Cross 18 came from Utah so it's trailer able. Last edited by CaptnChaos on Thu Jul 26, 2018 1:33 pm, edited 1 time in total. The most lucrative, unfulfilled gap in the market today is for a 16 to 17 foot performance, trailerable trimaran. No cuddy's nor sleeping quarters, just a fun/performance/racing trimaran. They went a little "different" in that it is designed to be sailed from the cockpit instead of out on the nets. I'll keep my SeaRail 19 for half the cost.